This meal was inspired when my friend Karrah took me to the most amazing place: The spice house. 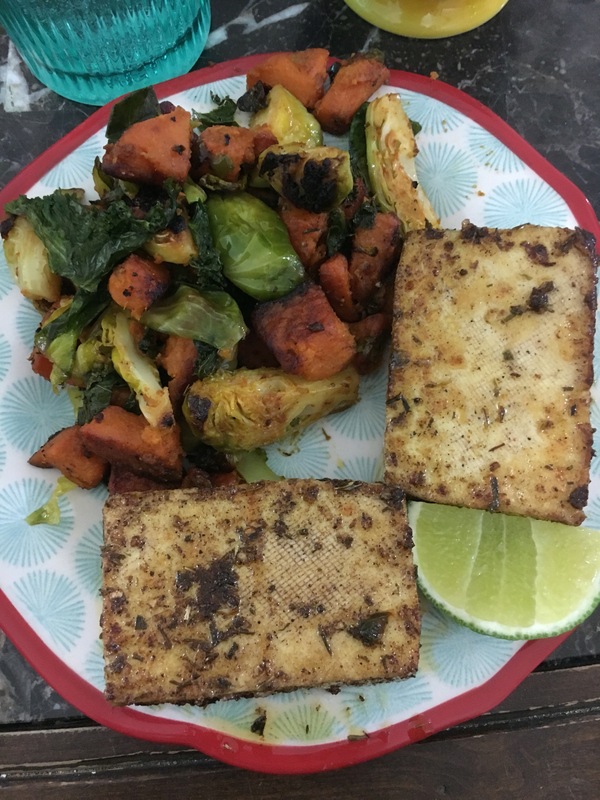 I could have spent hours going through the hundreds of fresh, delicious spices but I decided on a curry powder and a jerk seasoning, hence the jerk tofu. This recipe actually begins the night before. I recommend marinating the tofu over night in 1 tablespoon olive oil, 1 tablespoon lime juice, 1/2 tablespoon of liquid aminos (be careful if you’re using soy sauce as it more salty than liquid aminos), and 1 1/2 tablespoon of the jerk seasoning. Make sure the tofu is evenly coated and then stick it in the fridge in a tupperware container. When you’re ready to cook the tofu, all you will do is heat a little olive oil in a pan on med-low heat and cook the tofu 4-5 minutes on each side. This way the outside will be a little crisp and the inside will be nice and creamy. Start by peeling the sweet potato and cutting it into small cubes. Throw those in a pan with some olive oil on medium low heat. Let those cook for about 15-20 minutes, occasionally stirring. Now chop up the brussel sprouts into quarters or halves depending on the size. Chop up the jalapeno as well. I chopped my jalapeno really fine because I’m a wimp and didn’t want to get a large bite of jalapeno in the hash. I just wanted the jalapeno to flavor the hash. Also make sure none of the seeds make their way into the hash because they are super spicy. Add the brussel sprouts, jalapenos, salt, pepper, paprika, garlic powder, onion powder and liquid aminos. Season to taste. Let all this sautee for about 5 minutes, and then cover the pan with a lid and let it sit for 5-7 minutes. The last step is to separate the kale leaves from the stems and add them to the hash some more liquid aminos. Cover and let cook for 3-4 minutes, until the kale is slightly wilted. Your hash is now ready to be paired with some jerk tofu!